Every student at St. Peter the Apostle – from Preschool through 8th grade – is a beneficiary of our arts department. Our students are exposed to music, visual art, drama, and creative writing at every stage of their S.P.A. experience. Art: Students in grades Pre-Kindergarten through 8th grades participate in the visual arts program at St. Peter the Apostle. Students come to art class once a week. A Discipline Based Art Education approach is used in educating the students about the visual arts. This approach includes an introduction to art history, art production, art criticism and aesthetics with an emphasis on the elements and principles of design. We are teamed up with ARTSONIA where every child can have an online art gallery and preserve their masterpieces for all time while giving back to the St. Peter’s art department! Choir: The St. Peter the Apostle Youth Choir is open to children in grades three through eight. In addition to singing weekly at the 9:00am Mass, the Youth Choir sings for Confirmation, Christmas Eve and Holy Thursday. Music: The curriculum includes a variety of musical experiences allowing students to read musical notation, sing, perform on rhythmic and melodic instruments, become critical listeners and understand the importance of music to life. 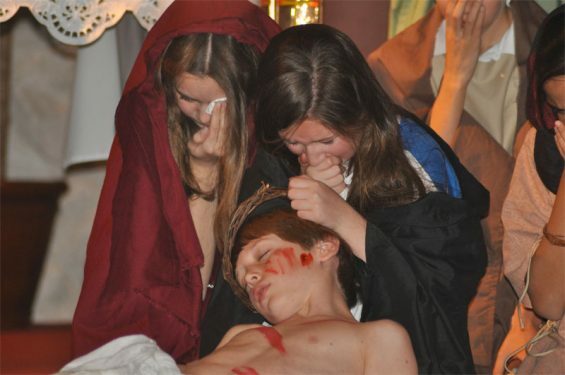 Drama: St. Peter the Apostle 6th grade students perform the living stations of the cross each year.